I took advantage of my train journey to Nottingham for this show by Cheek by Jowl’s Russian company to re-read the play. I wasn’t entirely convinced. It seemed to be too long for what Chekhov had to say. I wasn’t convinced by this show either. In typical CbJ style, we had a bare stage with some furniture and props scattered about. This became especially problematic in the third act, which revolves around people from the dangerous and dirty outside world of the fire intruding into the room that Olga and Irina now share. Irina also has to remark that she has forgotten the Italian for window, or for that ceiling, which left her gesturing helplessly into emptiness. At the interval, the lady sitting next to me said that the characters running round the stage to get to their positions was a bit odd, and the fact that all the military were in the same uniforms was confusing. She was quite right, though I think the first of these is just the way CbJ do things. I imagine the basic idea of this production was that these people aren’t really grown-up, as was evidenced by the dolls’ house that was prominently displayed on various parts of the stage in each act. 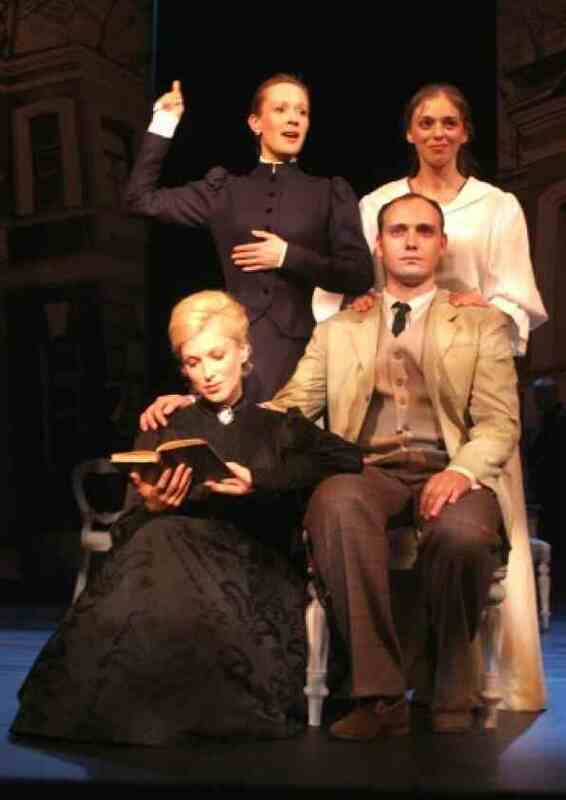 I thought the part of Natalya Ivanovna the lower-middle-class sister-in-law was dreadfully overplayed (by Ekaterina Sibiryakova). That’s lower-middle-class, not peasant-from-farmyard. In fact, there was quite a lot of overplaying– the essence here is the sudden changes of mood, not the underlining of them with screaming and shouting. At one stage we were being beaten into the famous laughter-through-tears with Masha hysterical at the departure of Vershinin, her husband in the false whiskers he had confiscated at school, and a gunshot off signalling the death of Irina’s fiance. NOW cry NOW laugh NOW cry again. It should be more subtle than that. The cast didn’t necessarily have a great afternoon in front of a non-Russian-speaking audience. Mikhail Zhigalov (Chebutykin), Alexander Feklistov (Vershinin) and Evgenia Dmitrieva (Olga) all fluffed some lines, and some other lines were just inaudible. Irina Grineva (Masha) came off best, as the only character inhabiting the adult world of competing demands and not in the end retreating into childish fantasy. PARACHUTE FOR SALE. USED ONCE. UNOPENED. All of these elicited laughter from an audience that was not in truth over-numerous: they were timidly clumped together in the hall in the same kind of way that the touring sets found themselves a bit overwhelmed by the space on stage. To summarise: these pieces are what we would call sketches (maybe The Bear and The Proposal are a little more substantial than that). I thought that The Bear was the best and funniest piece–the audiences as a whole sounded as though it agreed–you could see Popova and Smirnov turning into Beatrice and Benedick if they were given a little more time. A little underplaying would not have come amiss–I think the actors should seem to respond to what’s just happened rather than seeming to come out with what they were going to say anyway. The Proposal was funny too, but the panic of everything being about to fall apart was somehow missing. But certainly worth a visit! Note that updates to this posting will now be found here. See the posting below about Sovremennik’s visit in January. You also get the occasional production in Russian at the Shaw Theatre. 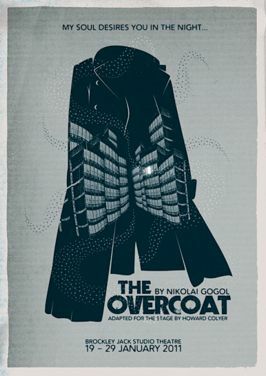 The Overcoat (Gogol’) Brockley Jack Theatre, 19-29 January; details here; and my reactions here. Naughty Chekhov (‘The most funniest collection of Chekhov’s farces and comedy sketches’) Lord Stanley Pub NW1, Jan 10 – Feb 6; details here. I have a feeling a Lord Stanley pub was a famous gay haunt in the days I worked in HIV/AIDS and knew about such things. There are more Russian plays promised here, but it’s not clear which and when. Meanwhile, the Arcola have written from their new base at 24 Ashwin Street, Dalston London E8 3DL to say that their new season will include Anna Karenina by Helen Edmundson, adapted from the novel by Leo Tolstoy (details here); Uncle Vanya by Anton Chekhov in a new version by Helena Kaut-Howson & Jon Strickland; and Seagull by Anton Chekhov in a new translation by John Kerr, Joseph Blatchley & Charlotte Pyke. I am a seagull. No, that’s not right…I am two seagulls. The Tempest (Shakespeare) Barbican 7-16 April 2011; details here. This evening comprised four short ‘plays by Chekhov’: The Sneeze, The Bear, The Jubilee, and The Wedding, presented by the Black Sun Theatre Company. Of course, Chekhov never wrote a play called ‘ The Sneeze’, so it was an adaptation of the story ‘Death of a Civil Servant’–who by was unclear, as was the identity of the translator. There were about 20 spectators as against four actors, so embarrassment was averted. In ‘The Sneeze’ David Fensom as Chervyakov did some fearsome overacting, and having all of the action in one time and place rather removed the pathos of the original story. ‘The Bear’ had more overacting (from Trudy Elizabeth Hodgson) and neither she nor David Fensom really gave the impression that they were members of the gentry: part of the humour derives from the elaborately polite way Popova asks Smirnov to explain how to use a pistol, so that she can then kill him in a duel. Then ‘The Jubilee’ concluded the first half of the evening: Elyse Marks seemed to be playing the same character (certainly in the same costume) as she had for Chervyakova, but David Fensom put in a good turn as a man being driven mad by his own failings and the unreasonableness of the world around him, while Trudy Elizabeth Hodgson’s tone of robotic insistence was highly effective here. The photographic stop-motion was effectively used and this one got the most laughs of the evening. But Chekhov’s ending (requiring as it does more than four actors) was omitted, so losing the dying fall (as also in ‘The Sneeze’). So after the interval the evening concluded with ‘The Wedding’, and four characters playing 12 characters (a few more present in Chekhov were cut entirely). This gave the actors a chance to show what they could do, and the audience a chance to get a bit confused (in fact the cast seemed to lose the plot as to who was who at least once). I’m not sure why the perfectly normal Russian word for cheating/sharp practice was translated by ‘monkeyshines’, which was new to me. All in all—an amusing evening but one which will have left both those familiar with the works and those unfamiliar puzzled about different things.